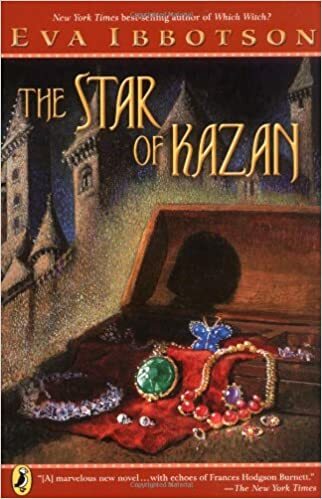 The Star of Kazan by Eva Ibbotson is a young adult novel. The first chapter was excellent and pulled me right in, but I found the following few chapters a bit lacking. They all served a purpose but I felt it took too long to get to the point and my attention started to wonder. However, once the ‘set up’ was over and the real story began, I was drawn back into the characters and was held tight. Warning: Spoilers may follow, so if you haven’t read the book but intend to do so, you may want to stop reading now. Yet this post is to do with titles, and how they relate to the story. In the case of The Star of Kazan — which was a set of jewels left to a foundling who befriended an old, sick woman but naturally circumstances kept the girl and the jewel apart — I was greatly disappointed because the Star of Kazan played such a small role that I felt the title was misleading. Up to the very last page I expected the young foundling girl to end up with the jewel but she only ever set eyes on the thing once and she never saw it again. To me, this felt like a broken promise. Sure, the title is catchy but I would have preferred the author to use a title that was fitted better, that didn’t leave me feeling cheated. Perhaps other readers don’t care about this type of thing, and to be perfectly honest I’ve never cared in the past, but on this occasion the title felt wrong. The title should have been connected with the foundling. Overall, the title was misleading, but the story (after an extra long lead in) was captivating.